11 a.m., The Solemn Eucharist. Whenever I hear this morning’s Gospel story (Mark 10: 35-45), I think back to my childhood days. I remember all those preparations for football matches, as we lined up to pick sides. And how we all wanted to be among the first to be picked for a team. Everyone wanted to be picked first, everyone wanted to line up there beside one of the two captains. No-one wanted to be picked last, even when there were enough places for everyone to get a game. And then when we were picked, how we wanted the glory. Slow at passing the ball, in case I might not get to score the goal. Thinking it better to lose the ball in a tackle than to pass it and risk to someone else scoring the goal and gaining the glory. No wonder the other ten were upset when they heard about this. But they are upset, not because they wanted to take on the servant model of discipleship and ministry. They are upset not because James and John had not yet grasped the point of it all. They are upset because they might have been counted out, because they might have missed out being on the first team, on the first XI. And their upset actually turns to anger. Not the sort of young men you might expect to be role models as mature apostles. Now, even that might not have been too bad an ambition. The man who stood at the right hand of the Emperor in the Byzantine court was the Emperor’s voice. What he said was the emperor’s word. And so, in the creed, when we declare our belief that Christ sits at the right hand of the Father, we mean not that there is some heavenly couch on which all three, Father, Son and Holy Spirit, are seated, comfy and cosy, as if waiting to watch their favourite television sit-com or this evening’s rugby match. When we say that Christ “is seated at the right hand of the Father,” we mean that Christ is the Word of God. 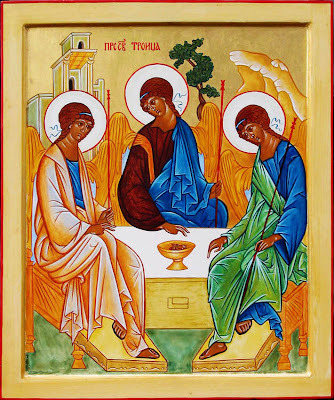 In some way, I suppose, this is what Andrei Rublev was trying to convey in his icon of the Visitation of Abraham, his icon of the Holy Trinity in the Old Testament. In that icon, the Father and the Spirit are seated on each side of the Son. In that icon, Christ is depicted wearing not the elaborate high-priestly stole of a bishop, but the simple stole of a deacon at the table. When James and John say they want to be seated at the right and left of Christ in his glory – not when they were sitting down to a snack, or watching a match together, or even at the Last Supper, but in his glory (see verse 37) – they are expressing an ambition to take the place of, to replace God. Little do they realise, it seems, that to be like God is to take on Christ’s humility, as we are reminded in this morning’s reading from the Letter to the Hebrews (see Hebrews 5: 8-10). We are made in the image and likeness of God, and then God asks us, invites us to return to that image and likeness when Christ comes in our image and likeness – not as a Byzantine Emperor or a Roman tyrant, but just as one of us. Just as one of us: he did not seek glory, or honour or power. He came to us as an exile, he came in tears and crying, he came in suffering and in death. Those who serve Christ today are those who attend to the crying, suffering and dying. If we would seek to stand alongside Christ today in all his glory, then we should seek to stand alongside those with ‘loud cried and tears’ (Hebrews 5: 7), those who weep, those who suffer, those who are powerless, those whose lives are worth little and those who are ransomed. Saint Paul uses regularly talks about ministry as διακονία, as if the foundation of is seeing that the hungry are served at the table, meeting the needs of those who are neglected and needy, collecting and distributing charity and making sure they are fed. A theatre poster in Crete recently reminded me that The Beggars’ Opera translates into Greek as Η λαϊκή όπερα. In other words, the liturgy of the Church only becomes a true service when we also serve the oppressed, when we become God’s ears that hear the cry of the poor, and act on that, when through the Church Christ hears that cry of the bruised and the broken. And to do this great task, as our ambitious pair, James and John, are reminded in our Gospel reading this morning, we must first be servants and slaves (Mark 10: 43-44). To be a great Church, to be the Church in its fullness, we must be a Servant Church, “For the Son of Man came not to be served but to serve, and to give his life as a ransom for [the] many” (Mark 10: 45). If we would follow Christ, as Christians and as the Church, then we are called first and foremost to serve the suffering, those who call out in loud cries and who are in tears. For you, who are the suffering, who are those whose cries are unheard unless they cry out loud, who are those whose prayers cry out for response (see Hebrews 5: 1-10)? Of course James and John found their request was granted, but not in the way they expected. This hot-headed pair, the sons of Zebedee, went on to serve the community of the baptised and the community that shared in the one bread and the one cup, the community that is the Church, the community that in baptism and in the shared meal is the Body of Christ. James – not James the Brother of the Lord, whom we remember next Friday (23 October 2015), but James the Great – was executed by the sword and became one of the first Christian martyrs (see Acts 12: 1-12). John too lived a life of service and suffering: he was exiled on Patmos, and although he died in old age in Ephesus, there were numerous attempts to make him a martyr. According to tradition, during the reign of the Emperor Domitian Saint John was once given a cup of poisoned wine, but he blessed the cup and the poison rose out of the cup in the form of a serpent. Saint John then drank the wine with no ill effect. It may be pious myth, but it seeks to tell us that Saint John too takes up the challenge to drink the cup that Christ drinks (Mark 10: 38-39). For there is another poison that can damage the Church today – we can fail to love. It is in sharing and serving with those who are most like Christ in his suffering that the world becomes united with the Christ we meet in Word and Sacrament here this morning. (Revd Canon Professor) Patrick Comerford is lecturer in Anglicanism, Liturgy and Church History, the Church of Ireland Theological Institute. This sermon was preached at the Solemn Eucharist in Saint Bartholomew’s Church, Ballsbridge, Dublin, on 18 October 2015.